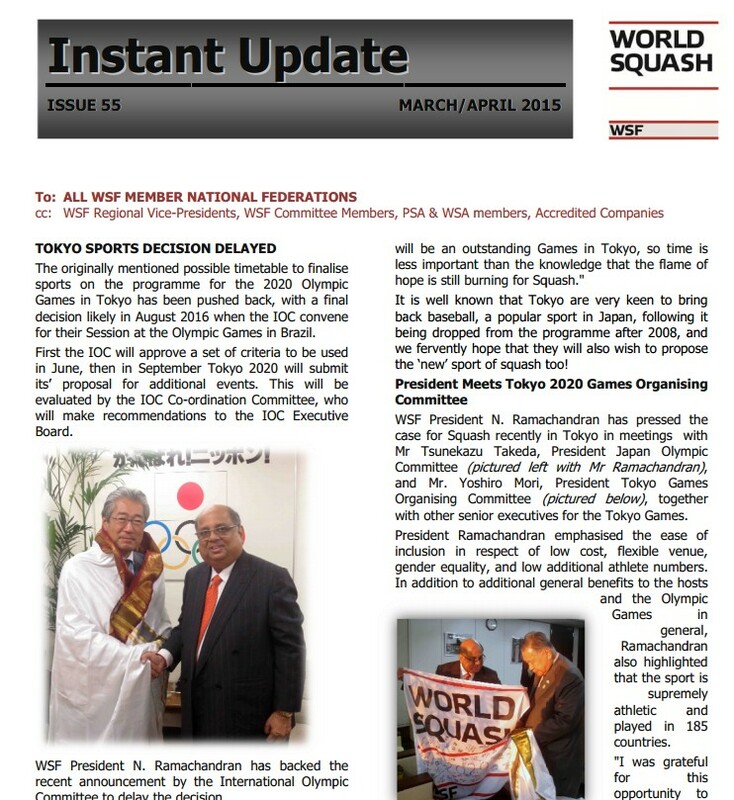 Distinguished veteran Thierry Lincou, the former world number one and world champion from France who is making his tenth successive appearance in the biennial WSF Men’s World Team Squash Championship, led the hosts to a confident 3/0 win over Netherlands in the first qualifying rounds of the 24th staging of the event since 1967. 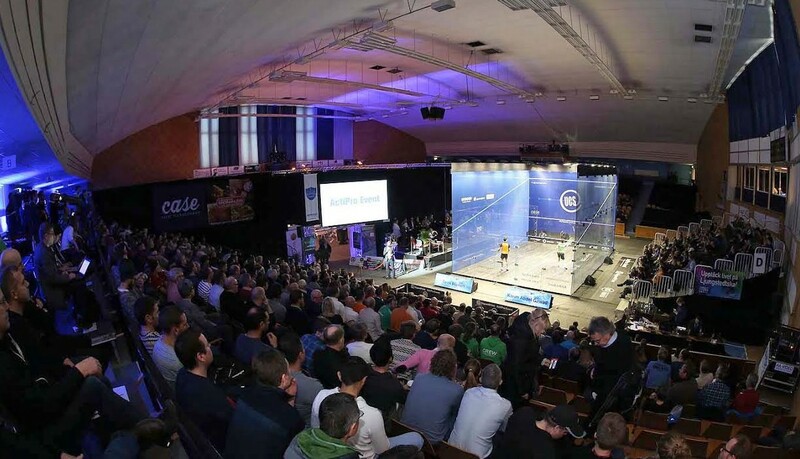 The championships are being held across two venues in Mulhouse – the Espace Squash 3000 Centre and the Palais Des Sports where, in front of a packed and partisan crowd, France took centre stage on one of three ASB all-glass showcourts spectacularly lined up side-by-side for the first time. Second string Lincou took just 35 minutes to overcome Dutchman Sebastiaan Weenink 11-2, 12-10, 11-3 before French number one Gregory Gaultier battled for 61 minutes to quash the challenge of eight-time Dutch champion Laurens Jan Anjema 12-10, 4-11, 12-10, 11-3 to confirm the French win. 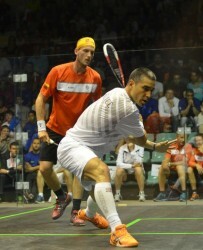 Third string Mathieu Castagnet made it a clean sheet by beating Marc ter Sluis 11-4, 11-3, 11-7. After retiring from the PSA World Tour last year, 37-year-old Lincou made an impressive comeback at last month’sEuropean Team Championships, chalking up five wins out of five, including the scalp of England’s world No3 James Willstrop. “I really got back into shape for the Europeans – that was really the tournament for me to show myself and my team-mates how good or bad I was for a few matches,” said the Boston-based Frenchman. “And it worked pretty well, I feel. When asked how to describe his feeling about competing in every world team championship since 1995, Lincou said: “My longevity makes me feel really proud – I feel really good and I hope that my fitness at my age will be an inspiration for the guys. Australian David Palmer was another former great making an international comeback in Mulhouse. Like Lincou, 36-year-old Palmer is also a former world number one and world champion – and gave fourth seeds Australia a solid start againstSwitzerland with an 11-9, 11-7, 11-3 win over 3/0 Reiko Peter. “I didn’t know much about my opponent, but the boys gave me some background,” said the US-based Aussie number two. “I must admit I was a bit nervous, a bit edgy on there – but once it started I felt more comfortable and got into a groove half way through the second. Team-mate Cameron Pilley went on to beat the highest-ranked Swiss player of all-time Nicolas Mueller 11-6, 8-11, 11-3, 11-9, before fellow New South Welshman Ryan Cuskelly wrapped up a 3/0 win for the team. But Ong Beng Hee, the Malaysian number one who shares Lincou’s tenth successive championship appearance achievement, was not so fortunate in his 2013 campaign opener. Fifth seeds Malaysia took on championship debutantsBotswana, seeded in the 21/24 group. Mohd Nafiizwan Adnan put Malaysia into the lead with an 11-6, 11-4, 11-5 win over Lekgotla Mosope – but minnows Botswana fought back when squad number one Alister Walker, ranked 15 in the world, beat Beng Hee in straight games. In the decider, experienced Muhd Asyraf Azan needed just 18 minutes to beat tournament first-timer Koketso Ntshebe11-3, 11-4, 11-6 to give Malaysia a 2/1 victory. Top seeds Egypt were given a stern test by Kuwait before beating the 17/20 seeds 3/0. Omar Mosaad, one of two members of the squad making his world championship debut, beat Kuwaiti Ammar Altamimi 11-9, 11-4, 11-5 before former world number one Karim Darwish resisted the challenge of Kuwait’s top-ranked Abdullah Al Muzayen 11-9, 11-7, 11-8. “It was my first match of the tournament, which is always a bit special, so it was good to get a win,” said 31-year-old Darwish after beginning his seventh world teams campaign. “Abdullah is one of the most gifted players on the Tour – one of the up-and-coming players – and we know him well as he comes to train with us in Egypt. But a major upset looked on the cards when 18-year-old Kuwaiti Yousif Nizar Saleh twice led Tarek Momen, a late addition to the Egyptian squad despite boasting a world No10 ranking. Momen ultimately prevailed 7-11, 11-5, 10-12, 11-5, 11-5 after 61 minutes. 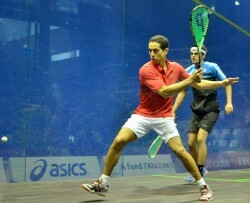 “Yousif played really well and took me by surprise,” explained the 25-year-old from Cairo afterwards. “He is so quick and good with his racket – I really struggled. And I had no idea he was only 18! “But I wasn’t expecting to be here – and took a 10-day vacation straight after the British Open,” Momen continued. 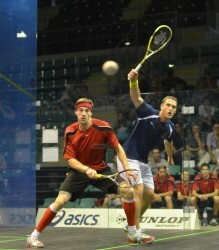 “This was my first match since playing Greg Gaultier in Hull. Teenager Saleh was understandably delighted with his performance: “I am very happy to have played that well – it was my first match against a top ten player. I did my best – but I didn’t expect to win two games! “I hope I can continue to play well for my country over the next few days – but my focus is on next month’s world juniors in Poland and I hope this will be good training for that. The long opening day finished with a thriller when eighth seeds India were forced to fight back from a match down to beat 21/24 seeds Argentina. It was outsider Robertino Pezzota who rocked the boat when the 30-year-old ranked 159 in the world recovered from 2/1 down to beat Indian number two Harinder Pal Sandhu – ranked almost 90 places higher – 11-9, 2-11, 6-11, 13-11, 11-6 in a 99-minute marathon. It was midway through the match that all the lights in the venue failed, leaving the three glass courts in complete darkness. “I was really focussed on this match as we felt we had a chance – and needed to win at two and three,” said Pezzota, from Rosario. “We don’t play regularly on glass courts so that took some getting used to. “I didn’t play well in the second and third games, but came back strongly in the fourth, and saved two match balls before winning it 13-11 – just before all the lights in the arena went out! “It was close to five-all in the fifth – then I raced away to win 11-6. “It’s my third time in the world teams – but that was certainly my biggest win.